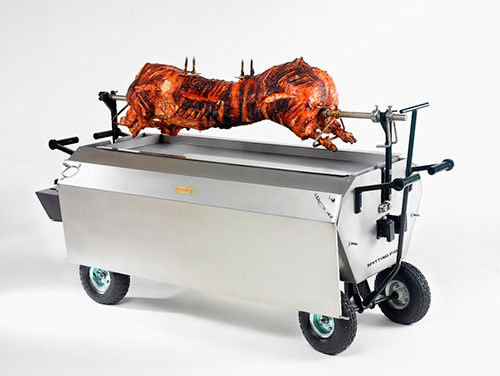 The idea to create the world’s finest hog roast machines didn’t happen overnight, our whole range of hog roast machines are a culmination of over two decades of hard work, knowledge building and testing within the hog roast and event industry. What sets our products apart is that the fact that they have the caterers interests at the heart of the design process. We have extensive experience working right across the event and catering industry, our knowledge within these areas spans from running kitchens for hotels and restaurants to operating the largest hog roast event catering company in the UK. Over the years we have enjoyed a considerable amount of success within our field of expertise and we believe has been down to our core beliefs. 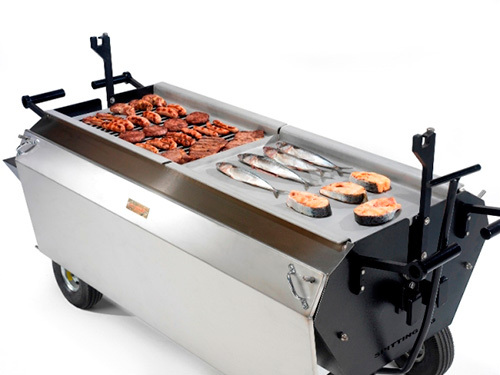 The Idea – having a background in both the specialist market of hog roast catering and working within the wider catering industry we were constantly working with hog roast machines and commercial catering ovens. Although both essential pieces of equipment within their given areas we often found them lacking in certain areas which were important to our operations. The commercial catering ovens although hard working and effective were unattractive and difficult to move. Conversely the hog roast machine of old were unreliable and one dimensional. This often meant that on certain events we were left with two pieces of equipment that didn’t exactly suit our needs. For a long time we struggled with this combination and we searched for a solution to our problem. We were looking for a piece of equipment that looked fantastic, was reliable, easy to move and could cook a wide variety of food products in different ways. It became evident that such a product didn’t exist in the UK market and we decided to meet a need that we knew was present. 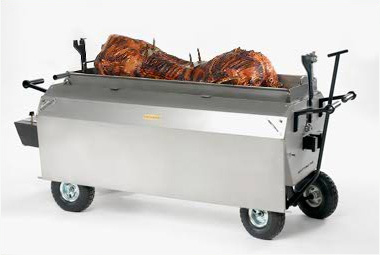 Taking both our background in the catering industry and significant experience in catering product design and manufacture we set about building a hybrid of the commercial catering oven and a hog roast machine that would marry up the two products advantages perfectly. This was no easy task even with state of the art facilities and access to an extensive knowledge base. Over a period of 2 years we tested and changed our design until we were satisfied with the results. We stuck fast to our 3 core beliefs and tried to design a product that would allow the user to offer first class service, strive for excellence and to improve the way in which they cook and work. Our machines have been such a success within our own catering operations that we decided to let every caterer right across the world experience the catering sensation. We’re are looking to the future and with the success of the current ranges we have available we are pushing forward to create new and exciting products for the catering industry. Visit the Factory – We know how important it is for our potential customers to understand both the product and the company they are buying into. That why we offer every customer the chance to come and visit us and our dedicated factory. Here you can look at our entire product range in our showroom and see how each product is designed to work in a commercial catering environment. One of our sales teams will be on hand to answer any questions you may have about the product. All of our staff are caterers themselves and because we still run a very successful hog roast and event catering company we can give you the very best advice in terms of your needs. You can even take a tour of the factory and watch the products come to life. Unlike other catering manufacturers all of our design and assembly is done in house in the UK based factory. All of our raw materials are sourced from UK companies and by taking full control of this process we can guarantee the highest quality from our products. 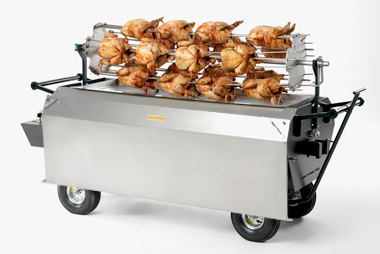 We also understand that not every customer can make it to our factory, and that’s why periodically throughout the year we take our range of hog roast machines on the road and come to see you. If you’d like more information on this then just send us and email or give us a call. More than a Product – We do much more than sell a product. We offer a complete service to support that product. It’s this support and advice that really set us apart from the competitors and helps our customer’s businesses and operations grow. We have extensive experience within the event and catering industry and we look to pass on this knowledge wherever possible. From using our products to running a business to getting the most from events we have every area covered. Each of our products comes with a full manual showing how to get the most from your product, we also offer other means of support via our website articles section which has lots of different information from the full spectrum of the industry, also our you tube channel and blog has lots of helpful videos to give you a visual reference and let you keep up to date with the latest news. Finally we are of course on the phone Monday – Friday 9am till 5pm should you need any help of advice over the phone. We also offer next day delivery on parts and accessories as standard; we offer Gas Safe service inspections both on site and at the factory. The service has no boundaries we can even offer training packages whereby one of our hog roast and catering experts will actually come work with you on a live event, to give you that realism. So if there is anything we can do to help or you’d like to learn more about our award winning hog roasters then get in touch today.